Naim Mu-so Qb review | What Hi-Fi? In 2014, Naim took some time out from producing more traditional hi-fi kit to have a punt at the wireless speaker market, and not only gained a legion of new fans, but also proved it could bring hi-fi sound quality to a one-box design, albeit at a price. Naim has gone a step further, by taking everything that we love about the original Mu-so and squeezing it into a more affordable, compact design. 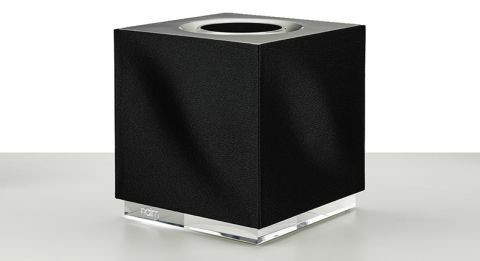 The result is the Mu-so Qb, a stylish speaker with a small footprint, but a big personality. If you've seen the Mu-so, the Qb’s design will look familiar, except instead of a long, rectangular outline, the Qb is a compact cube shape. It’s a striking yet minimalist design, with an illuminated acrylic base that makes it look as though it’s hovering; its otherwise crisp outlines softened by the characteristic ripple of the Qb’s grilles. As with the Mu-so, these grilles can be switched up from a dramatic black to more playful choices of blue, red or orange, while the back edge of the cube is given up to the same distinctive aluminium heat sink that kept things cool on the original. Plenty of design similarities then, but while the original Mu-so needs a considerable amount of space, the Qb’s more flexible design means it can fit on your bedside table, on the kitchen worktop or in the corner of a room. It’s impeccably made – heavier than it you might expect, and topped with the same gorgeous touchscreen dial that we loved on the original Mu-so. As well as adjusting the volume, the aluminium dial also doubles as the control panel for the Qb, allowing you to tap illuminated icons to select inputs and manage playback. It’s a stylish and sophisticated system that works wonderfully well, while also looking the part. Considering the design has been borrowed from Naim’s £100,000 flagship Statement pre/power amp, we’re not surprised. Naim has carefully positioned a five-strong custom driver set up into a sturdy casing behind the front panel, placing some at an angle in order to widen the sound. There are two dome tweeters, two mid-range drivers and a single woofer supported by two passive radiators, which helps the Qb go deep in the low end. It’s run on the same 32-bit DSP as the Mu-so too, all of which comes together to deliver a huge 300W of sound – no mean feat for a speaker of this size. But the real coup for the Qb is that it comes with all the streaming features found in the bigger Mu-so. Apple AirPlay, aptX Bluetooth, Spotify Connect, Tidal and internet radio are all present, as is uPnP for sniffing out music stored on your home network. On its back panel there are a number of physical connections, including a 3.5mm aux in and an optical input, plus a USB port for external drives and Apple devices. There is support for everything from MP3s all the way up to 24-bit/192kHz hi-res tracks in WAV, FLAC and AIFF. The only catch is that you’ll need to be hardwired to get the very best sample rates – any hi-res tracks streamed over wi-fi will be downsampled to a still respectable and 'better-than-CD-quality' 24-bit/48kHz. With all the connectivity to choose from, connecting to the Qb can be as simple as pairing via Bluetooth, but you’ll get the most from it (and unlock all of its functionality) by hooking it up to your home network via wi-fi or ethernet. For the former, the easiest way to get things rolling is to download the Naim control app, ensuring your device is connected to the network. The app will then walk you through the set-up process – with an iPhone or iPad it’s as simple as selecting the Qb from a list of Airplay devices within your wi-fi settings menu. Once you’re set up, the app of course doubles up as a controller – handy since there’s no remote in the box. We don’t miss it though – the app is well designed and allows you to skip between sources, select and edit internet radio presets and control playback with ease. It also gives you access to further settings like controlling the base’s illumination and setting the alarm clock. It will even allow you to set up a multi-room system with up to four other Mu-so’s, which can play in simultaneously or independently – all controlled from your phone or tablet. One of the first things that strikes us about the Qb is just how powerful it is for a small speaker. It delivers a size and scale that you just wouldn’t have expected from such compact dimensions. It suits its rather bold demeanour, with an upfront, muscular presentation that certainly isn’t short of clout in the low end. Listen to Top Boy by Blacks and the larger-than-life bassline is deep and weighty. It’s taut and controlled for the most part, if perhaps a little on the rich side for neutral ears, but it does deliver a real sense of solidity to its character that helps with lower quality recordings and streams. There is a hint of thickness to the bass when the volume is pushed, but most usage won’t require anything like the volume levels you have to reach before it becomes noticeable. While the bass steals the show in the sonic signature, its solidity rubs off on the midrange and treble too. Vocals are pretty clean and focused, while the high-end sounds open and composed – there’s little hardness here. We note a slight lack of subtlety in the midrange when compared with the B&W Zeppelin Wireless though, with finer details staying hidden beneath its bold-as-brass presentation. Dynamics, too, are not quite as expressive. However, the likes of the larger (and newer) Audio Pro Drumfire are clearly better when it comes to outright insight, transparency and scale, although the Qb's timing is still something it can be proud of alongside rivals. We praised the original Naim Mu-so for its ability to deliver hi-fi sound in a wireless speaker, and the Qb follows in these footsteps with a big, authoritative sound that belies its small stature. It complements the Mu-so’s refined sound with one that’s a touch more mainstream in balance, packing a punch in the low end and delivering real presence and solidity. Its confident persona means the Qb falls a touch short with finer detail and dynamics, but it makes up for this with a tight presentation that’s both upfront and exciting. Add a whole load of streaming connectivity and the Qb is a comprehensive wireless speaker. But £600 is still a lot of money to spend, and while the Qb might not rate as one of the very best at this price, it remains a product to take seriously.